This page lists some of the comments that we have received from our clients. The flexibility, along with the quality of the models, is what makes your software so appealing. Thanks again for your admirably prompt attention to my questions. I'm Head of Capital Markets Division at the Central Bank. After all the recommendations that we had from the companies that we work with, it seems your software is one of the best in the market. We did not have any problems with MBRM. Your product has worked flawlessly for me every single day. And the support that you personally provided when I needed it is absolutely the finest that I have encountered in my 25 years in the software industry. Your product and service are so superior. During MBRM's 2 day training course, we had a live amortizing swap deal to price. Using MBRM's calculated values, we were able to negotiate a $50,000 savings on that one deal alone. 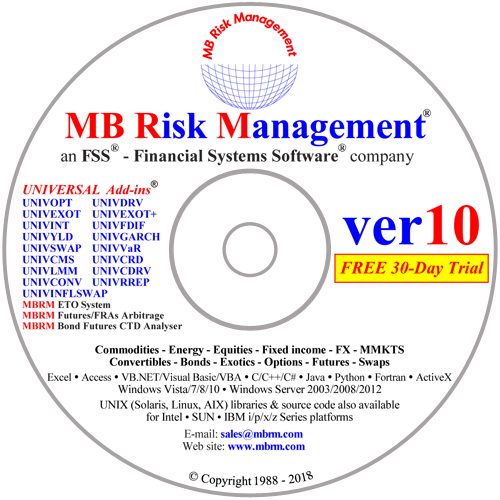 Congratulations, you software is now used for the whole risk management department. What's excellent about your system is that you can call one function to handle a very wide range of instruments. It was nice to talk to you, and I must say I appreciate even more the way your add-ins are structured (specifically the .lib stuff which will prove very useful). This is going to make any development work I might have so much easier. All merits of BGM which you pointed out were true. We were impressed with that calibration speed. We respect your academic experience and professionality in finance. Your product is working really well. I am very satisfied, especially with your superb support. We understand MBRM is the leader in risk management and pricing models. The decision to use your Excel add-ins at the Central Bank has been made. If Dr. Barakat is ever visiting our city, we would be very pleased to welcome him at the Central Bank. I read in a book that "there is no commercially available" Finite Difference model that handles skews and term structure of implied volatility and interest rates. I would say that "there is one" by MBRM. Thank you very much for your time and great help. You have worked very closely with is. If we need something done, we are likely to get it immediately. I don't think you guys sleep. Thanks for the fantastic speed of response - do you ever sleep? It was good to meet you. You have done such a good job of getting your product in front of everyone (hence the long client list), that I hadn't realised that I actually hadn't met you before. In fact everyone I speak to seems to know of you and your product which is quite a feat given this industry. In my opinion it does what we want to do and I feel confident that if there are one or two products that is not obvious to me how to price, you will happily advise us or add them to the package in future versions if necessary. Indeed I was really impressed with the prompt response to my queries during the trial period. We have tried a number of option pricing software and found your UNIVOPT the fastest. Your binomial option pricing model is electric. It was instantaneous. We wrote our own but it was too slow when analysing a portfolio. I am quite impressed with the quality of your product. Your level of sophistication is certainly beyond that of most other add-in type products currently available. I must also thank you for your excellent support and the time you have spent in explaining to me the advanced features and capabilities in your software. You guys are great. I love your system. We were successful in calling your routines from our database system. We currently have our own routines to price the hedges, however, we were looking to your routines for calculation speed and reputation as an industry standard. I am incredibly pleased by the speed at which you created a customised system for our requirements. I will recommend it to all my friends. One of the major differences between MBRM and other software houses we have dealt with is the personal service we receive. When we have a question, we get straight through to someone who can help us. This is invaluable. You have a really great system. Your software is very precise and we are very happy. Your system is phenomenal. Your flexible approach to quick customisation is just what we are looking for. I feel guilty about using your software successfully for many years since it cost so little. We use it to link with Reuters real time feeds. I think your add-ins are very useful. We use them to price Bermudan options on zero-coupon bonds. It is widely recognised that your software is very good and sold at rock bottom prices. We have utilised your Universal add-ins to calculate the capital adequacy sensitivities (e.g. deltas, gammas and scenario sensitivities) required by the central bank. Not only are they inexpensive, they are complete and tremendously flexible. They can handle all the instruments and the central bank has approved our system. I have found your UNIVOPT and UNIVEXOT software essential to analyse energy options, including on energy swaps. I will recommend you to all my clients since they do not have very sophisticated systems for derivatives. We have been using your UNIVOPT for a number of years. We recently hired a new trader and asked him which system he preferred. He said he has worked for 4 investment houses over the last 9 years and he has only ever used UNIVOPT. I am very impressed with the professionalism and sophistication of your Convertible Add-in. We do not have the time to implement all it's features in our own in-house model. We have looked at your multi-factor convertible model and it looks great. It gives us a competitive edge over the competition who use a single factor convertible model. We have been one of your earliest customers and you have always looked after us. We have begun using your new Universal Convertible Add-in and it deserves to be the industry standard. We found your policy of allowing the use of both the 16 bit and 32 bit versions of your add-ins on the same machine as very useful since we have some dealers using both 16 and 32 bit applications under Windows NT. Some other software houses ask us to buy two different versions of their software, which effectively double their prices when compared to yours. We use your term structure interest rate models to assist us in our asset/liability management since they enable us to model future interest rate movements, together with our contingent cash flows. If you keep going like this, you will be putting pricey quants in the City out of work!! I was only kidding! The quants will use your software to build more advanced models. This kind of enhancement of everyone's knowledge and understanding of derivatives will only serve to reinforce the importance of quantitative analysis, rather than to undermine it, and I'm all for it. When are you re-locating to Seattle? The Universal software is a bloody good system with great functionality. The easiest to use of all the add-ins I have seen. I have used it for so many years that it is second nature to me. I must be your best salesman, I have always recommended you. Your products are very complete and exactly the kind I was looking for. Recently I downloaded your new version of the add-ins and was astounded by all the possibilities it has. There is only one word that I can say: SUPER !!!!!!!!!!!!!!!!!! I really appreciate your quick response. I shall get back to you if I have new questions... or need to go to the next level. Thanks very much. You have been very helpful - it certainly seems that you clients are right that your speed of response is definitely one of your major strengths. We are setting up a swap and FRA trading desk in Mumbai, India and are looking for a pricing and risk analytics engine. I have heard of your formidable reputation in this field and am writing to inquire if you would be able to provide us a suitable solution. Thanks a lot for your rapid answer! I was very impressed by the products on your site. For me you are genius. Thank you for your help with this. I made the changes you recommended and everything seems to be working wonderfully now. I especially appreciate how quickly and thoroughly you have responded to my requests for help. I will strongly recommend MBRM to all my option-trading clients. Kudos to you and your programming team! Wonderful job on our UMS system & we are all extremely pleased with your product.